Welcome to the worlds greatest guide to Women's Cotton Lounge Pants. Are you actually looking for Women's Cotton Lounge Pants? Well, we hope you are because the reality is that you have found our ladies cotton lounge pant page. In this women's clothing section of the Apparel Search directory, you will find all sorts of interesting information regarding the subject. Lounging around is an art form. It is not as simple as you may think. It is all about getting yourself as comfortable as possible. Part of the process includes picking out the proper garments. Lounging around in a cocktail dress would not be our first choice for comfort. Loungewear is defined as casual clothes suitable for relaxing and laying around at home. Pajamas and sweat pants are fine example of loungewear. However, you can also purchase "lounge pants" which have been designed specifically for lounging around the house. Yes, some ladies will wear them out of the home as well. Pants are an item of clothing, worn from the waist to the ankles, covering both legs separately. The type that is made from lounging is often made of cotton or cotton blend fabrics. You will find many fabrication options are appropriate for women's lounge pants. For example, cotton knit, flannel, thermal, waffle fabric, etc. Cotton is an excellent choice because of it is a natural fiber that's breathable and lightweight. Learn about a few of the benefits of cotton fabric for ladies lounge pants. Pajama bottoms can also be used as lounge pants. Pajamas are loose-fitting garments derived from the original garment and worn chiefly for sleeping. However, like I said, they can also be worn for lounging. If you shop online or in stores, you will find that many fashion retailers have an extensive selection of cotton lounge pants for women. You may also have interest in Women's Cotton Sleep Pants, Women's Organic Cotton Pants, or the Women's Pants guide. Apparel Search is a leading guide to fashion, style, clothing, glam and all things relevant to apparel. 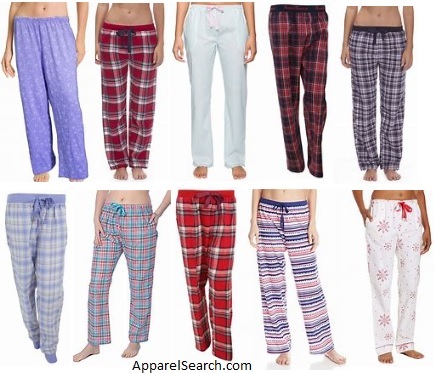 We hope that you find this Women's Cotton Lounge Pants page to be helpful. If you want to be even more stylish, you should wear your favorite clothing today. You may find the following sections of our website to be of interest.